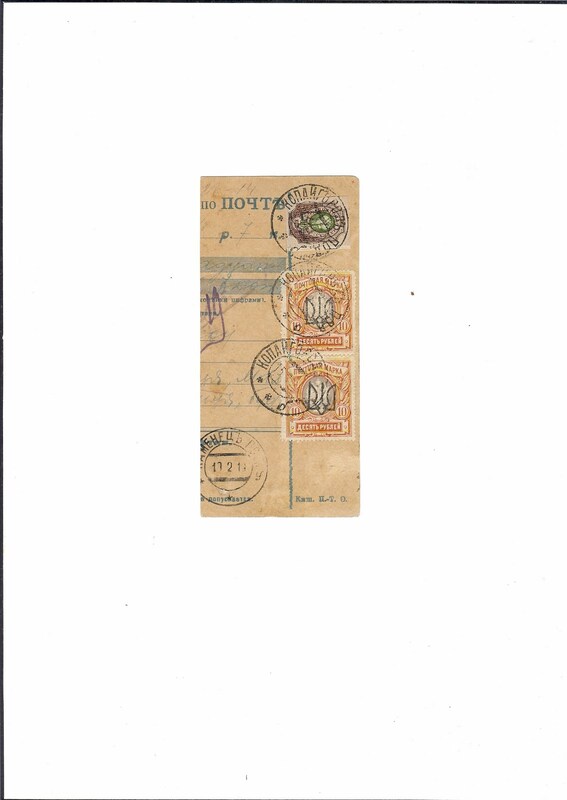 Trevor Pateman's Philately Blog: Was there a Kopaihorod Local Trident? When I first looked at this item, I thought it was some kind of fake. Podilia Tridents do not look like these neat and crisp overprints. These overprints resemble type Ia, but on the 50 kopeck imperforate type Ia is very scarce and on the 10 rouble it is a rarity which Bulat does not think exists in used condition. 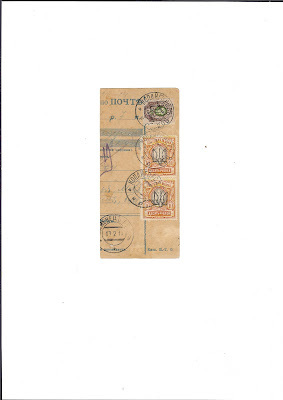 Bulat does not list a local Trident for Kopaihorod or illustrate any type which looks like these overprints. They are not Popoff / Popov types, for example. A thought occurred to me. This fragment is dated in the sixth month of Trident use. Someone has worked out that the 50 kop imperforate and 10 rouble perforate are rare with Type Ia and they have created these stamps with fake overprints. And where are the mint examples you would expect from a philatelic scam? Then I was flicking through Dr Ceresa's Special Tridents Handbook. Amazingly, he lists a Kopaihorod local trident on the basis of one MTF fragment in the Mallegni collection. The Trident is applied on 1, 2 and 5 kop imperforates. The MTF despatch cancel is dated 21 2 19 - less than a week away from my fragment. There is a poor reproduction of the fragment on Plate CDXXXVIII of the Handbook. Case proven? I am still not sure. There was philatelic activity in the Kopaihorod post office - one comes across stamps CTO on piece from this office. Maybe some philatelist presented the Post Office with a swanky handstamp to use on unoverprinted stamps in their stock. Who knows. Any better ideas?